The men close to her called her by the sweet and simple name Sara, but she was anything but sweet or simple. Although she was only 16 years old when the war started, Tokyo Rose called her the old lady. She survived nearly fatal wounds at Iwo Jima on February 21, 1945, only to die a most inglorious death after the war at the tender age of 21. She was the USS Saratoga (CV3). The New York Shipbuilding Company laid her keel in 1920 as a battle cruiser. World War I had just ended, and imaginative military minds were beginning to envision airplanes flying into combat from the deck of a ship. So in 1922 the Navy decided to convert her into an aircraft carrier. Launched on April 7, 1925, she was impressive by any standards. Displacing 33,000 tons, measuring 888 feet in length and 106 feet at its widest point, her crew of 2,111 could guide her through the water at a speed of nearly 34 knots – that’s about 40 miles per hour. The first planes to land on her deck were small, slow biplanes, a far cry from the fast and deadly fighters she later carried into combat. While participating in naval exercises before World War II, Sara was instrumental in developing strategies and tactics for a kind of warfare that had never been seen before. When the Japanese attacked Pearl Harbor on December 7, 1941, Sara was in San Diego. She sailed immediately for the South Pacific, refueling in Pearl Harbor before continuing on toward Wake Island. On January 11, 1942, the Saratoga received her first battle wounds and crew casualties. A torpedo from a Japanese submarine hit her without warning. Six of her crew were killed. She managed to limp back to Hawaii under her own power. She then headed for Bremerton, Washington, on the Puget Sound, for permanent repairs and the addition of improved anti-aircraft guns. She entered her first intense combat operations in August, 1942, when she launched planes in support of the assault on Guadalcanal. Her planes sank the Japanese carrier Ryujo and damaged the Chitose, a seaplane tender. A week later the Saratoga had to return to Hawaii for repairs after being damaged by a Japanese torpedo. Sailing from Pearl Harbor on November 10, Sara spent the next year and a half in combat operations in the South Pacific. She provided air support for some of the most legendary island invasions, such as Bougainville, the Marshalls, Eniwetok, and Engebi. In November, 1943, the Saratoga left the main theaters of the war for nearly a year to participate in exercises with less experienced British and French aircraft carriers. After intensive training, the Saratoga and the British carrier HMS Illustrious conducted very successful attacks on port facilities and oil reserves on Sumatra. In June, 1944, Sara returned to the Bremerton dry docks for repairs. That’s when Sharon native Harry Jones joined her crew. He had enlisted after completed tenth grade at Sharon High School. 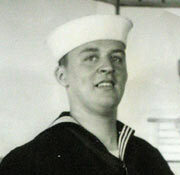 Jones was supposed complete six weeks of training at Great Lakes Naval Station, but the Navy was so short of men that he spent only three weeks there. After a week’s leave at home, he headed for Bremerton to join the crew of the Saratoga. While the carrier was being repaired, Jones trained to be a plane captain at the naval air station in Arlington, Washington. When Sara left Washington in September, 1944, headed for Pearl Harbor, Jones found himself in a different world – one with incredible highs and lows. Well, almost every day and night. There were times when the weather turned a little ugly. As plane captain, Harry was assigned to one plane. His job was to maintain it and prepare it for combat operations. To make sure the plane wouldn’t sput while taking off, he had to get into the pilot’s seat and start it up every day. Harry and his pilot, H. C. Palmatos, weren’t the best of friends. For several months at Pearl Harbor, the Saratoga trained night fighter squadrons and developed the techniques and tactics of night flying. Then on January 29, 1945, she headed out with the USS Enterprise to provide day and night aerial support for the invasion of Iwo Jima. Jones was thrilled by the sight of the fleet. But Jones wasn’t the only one watching the fleet in general, and the Saratoga in particular. The Japanese were watching it, with a focus on the USS Saratoga..
On the fateful day of February 21, 1945, Tokyo Rose’s compatriots made good on her prediction. Jones prepared his plane for combat. The pilot, H. C. Palmatos, took off to attack the island. Then, at 1700 hours (5 pm), all hell broke loose. 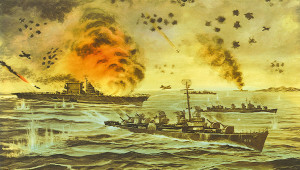 The Japanese hit the Saratoga with the most intense assault of the war against a warship. 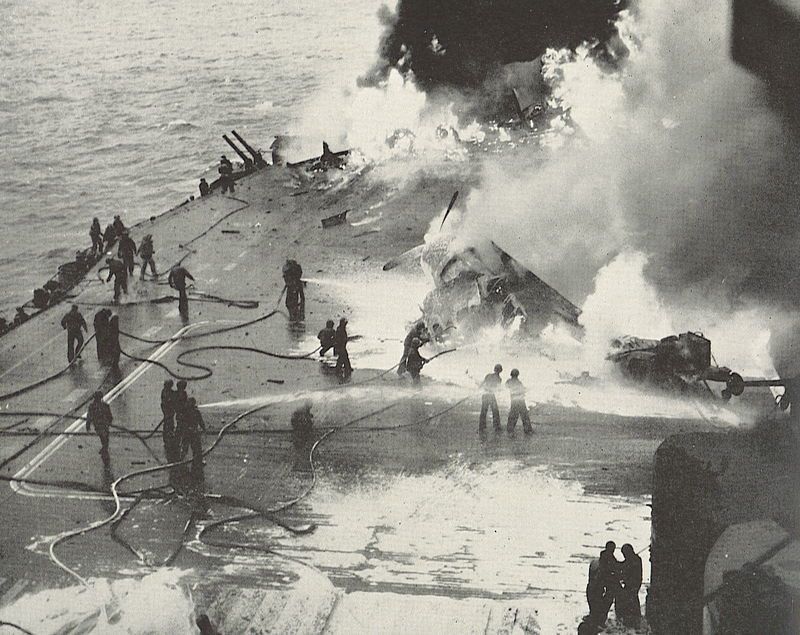 Within three minutes, they hit the Saratoga with five bombs. During the fight, which lasted two hours, Sara was strafed with machine guns and hit with seven bombs. Five Kamikaze suicide planes dove into her, their bombs causing huge explosions. Somehow Sara managed to keep afloat and sail away from the battle zone. The attacks killed 123 men and wounded scores more, including Jones, whose duties required him to be on deck. While fighting the many fires, Jones remembers running with the bullets from Japanese fighters tearing up the deck on both sides of him. He was hit in the back with a piece of shrapnel. Two days later, U.S. Marines raised the flag on the top of Mount Suribachi. That is forever memorialized in one of the most famous war monuments in the world. When Sara’s crewmembers see it, they remember their part in the battle. Without setting foot on Iwo Jima, they helped to make that victory possible. When Jones talks of his worst memories, he doesn’t describe the actual battle. He talks about the aftermath. He also remembers the long voyage back to the United States for repairs. That was the end of combat for Sara, but not the end of her service. Fully repaired by May 22, she sailed back to Pearl Harbor and resumed pilot training until the Japanese surrendered on August 16. She was then transformed from an aircraft carrier into a magic carpet, bringing veterans back to the United States from the South Pacific. Before the end of Operation Magic Carpet, she had brought 29,204 veterans home, more than any other ship. After the war, the USS Saratoga was rendered obsolete by larger, more modern carriers. She had one more bit of service to perform, however – not as a hero, but as a victim. In 1946, the United States conducted nuclear bomb tests at Bikini Atoll. 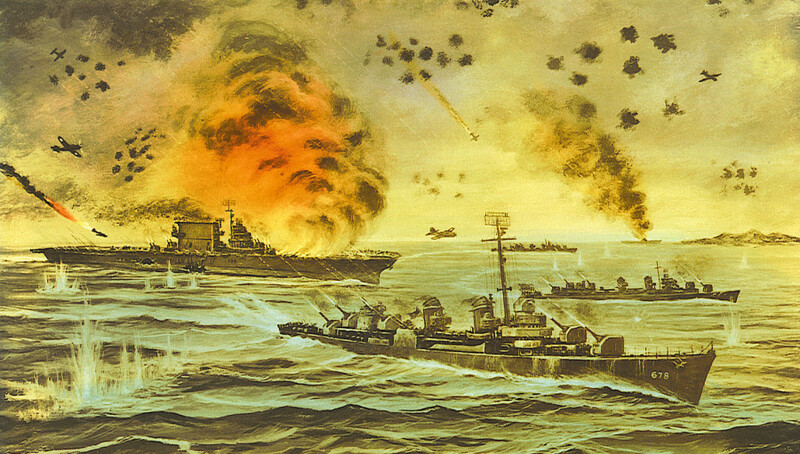 They sacrificed Sara to determine the effects of the atomic bomb on naval vessels. She was sunk by an underwater bomb detonated 500 yards away. To those conducting the testing, the USS Saratoga was an inanimate floating conglomeration of metal that deserved nothing more than to be sacrificed in the name of progress. But to the sailors and airmen who served on Sara, she was a very personal friend and fellow combatant. Sara is at the bottom of the Bikini Atoll, and most of her crew are gone, but her dream, her legacy, deserves to endure. The next time you look at the Iwo Jima memorial, pay tribute not only to those Marines who raised the flag, but also to Sara, her crew, and all the sailors, airmen, and soldiers who helped make that possible.